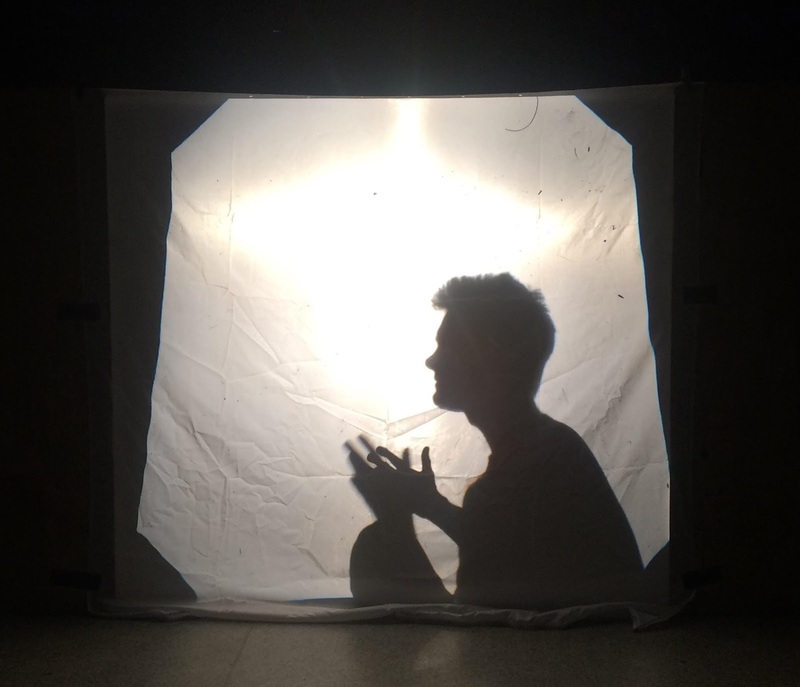 Stepping out of the shadows: Shadow Puppetry! 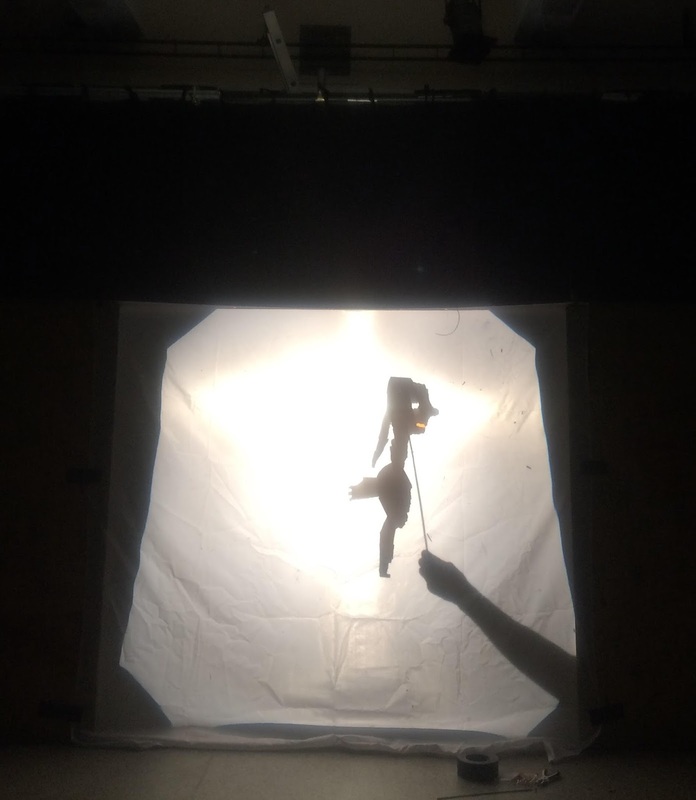 For our last session on this course we examined what might have been, for many of us, our first foray into puppetry – whether this was on a bedroom wall in the dimming lamplight or against the canvas of a tent with a torch whilst camping – we all have childhood memories of making shadow play. 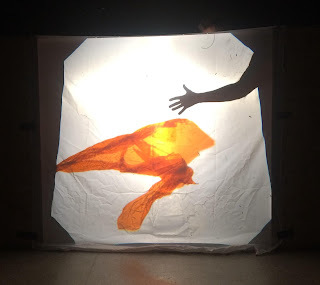 Shadow puppetry is an ancient form of storytelling and entertainment, an old tradition with a long history especially in Southeast Asia where it is often revered as art! Although I think my shadow puppetry has a little way to go before it could be described as such...! All that's required is an object, a light source and some kind of screen. We were to make the objects, the light source was supplied by a mobile phone or a projector and there were two screens set up – one made from two tables put together and turned on their side with a sheet across the table tops, the other was a frame with a piece of fabric around it. Oli showed us how all the components worked together and gave another (alas the last) of his entertaining demonstrations! Then we made our own shadow puppets. I wanted to experiment with colour but found that they didn't really show up effectively on the screen. Instead I resorted to making shapes out of my hands just like the shadow play we engage in as children that I mentioned above. The pictures on the left show various stages of Oli's shadow puppetry demonstration. The orange piece of cellophane was a simple scrap of material placed against the projector behind the screen - but suddenly it became a fish! It's wonderful how the imagination can re-imagine what it really sees! Here (left) Oli has made a shadow puppet out of cardboard. 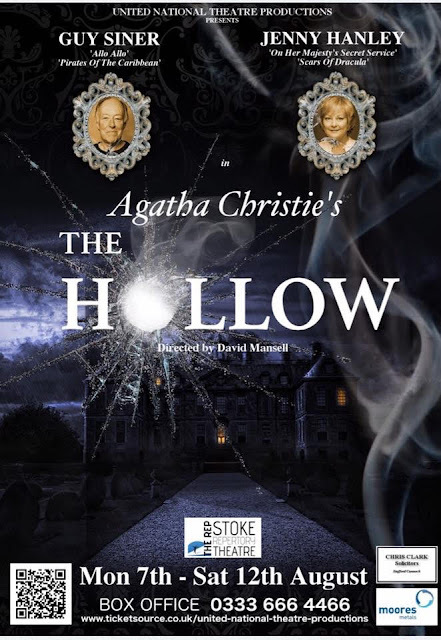 It was quick and rough-shod but the coarse finish seemed to lend itself well to shadow puppetry - every irregularity and distortion was empahsised in shadow form and that made what we saw so much more interesting! 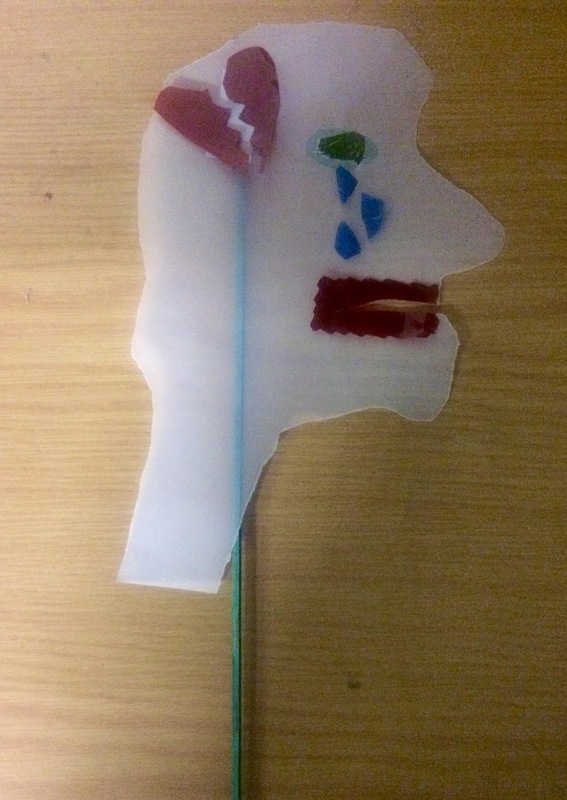 Some more features were tacked on to the puppet using split-pins and a rod was attached to it too (left). The rod allows the puppeteer to stay out of view and more behind the screen. After Oli's demonstration we were given the opportunity to make our own shadow puppets with various materials provided and to have a play around. I made this curious creature (photo below) out of tracing paper and cellophane and attached a rod to it. I wanted to experiment with texture and colour but quickly learnt that the soft texture of the tracing paper didn't lend itself well to the medium and that the colour didn't come across very vividly either. As I said above, it seems rugged puppets work better. Making holes for the light to shine through also seems to be a powerful way to liven up the object. 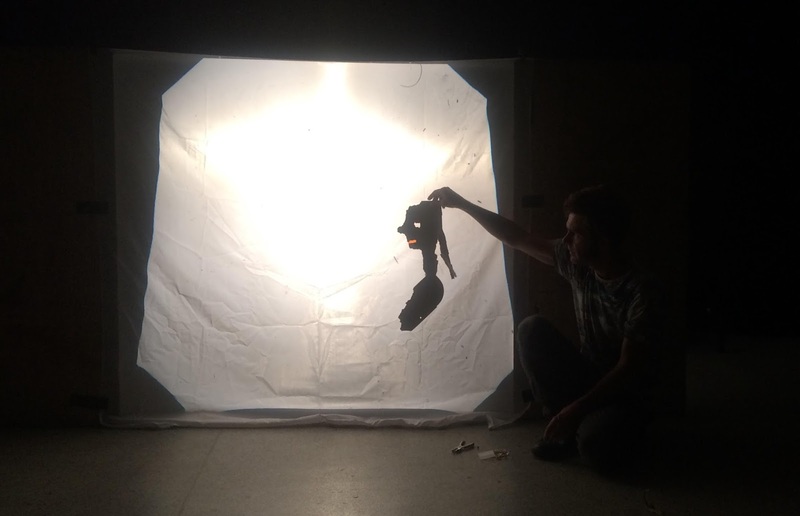 To puppetry - and beyond...! 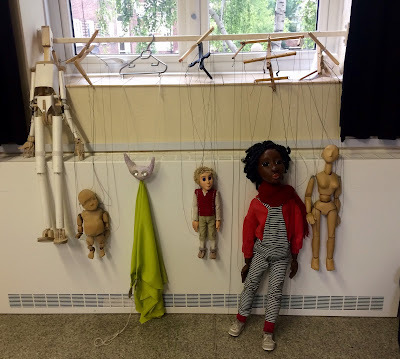 I haven't met the Pinocchio puppet yet and I don't quite know how he will be made / designed but I feel more ready to engage with him now than I would have done 10 weeks ago before the puppetry foundation course began! Its given me exactly what it says on the label – a solid 'foundation' – from which to spring...! Last weekend I met up with some of the creative team behind The Adventures of Pinocchio including the incredible Guy Siner who will be playing Gepetto! 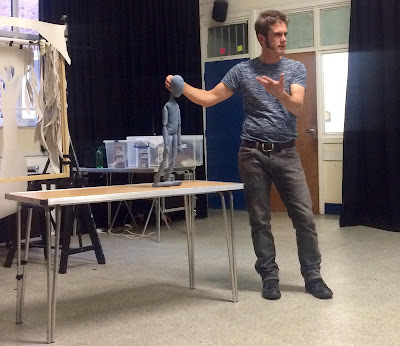 It was a great opportunity to reflect back on the puppetry course and to discuss plans for the near future as we progress further with pre-production. 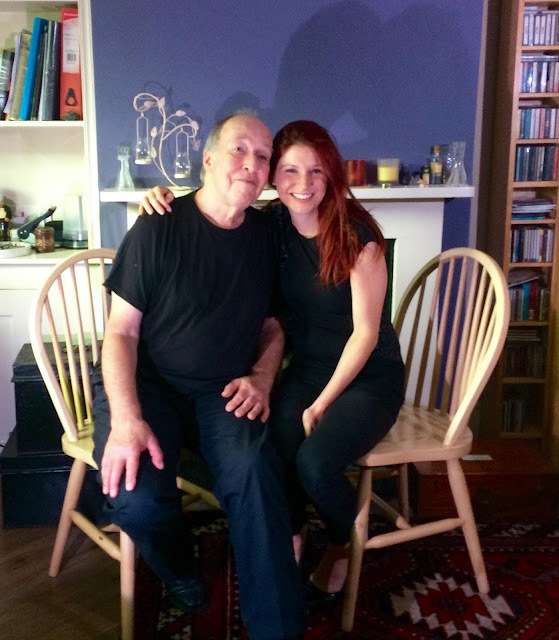 We made a promotional video which will be online soon, so do look out for that...! We've done just what we set out to do. 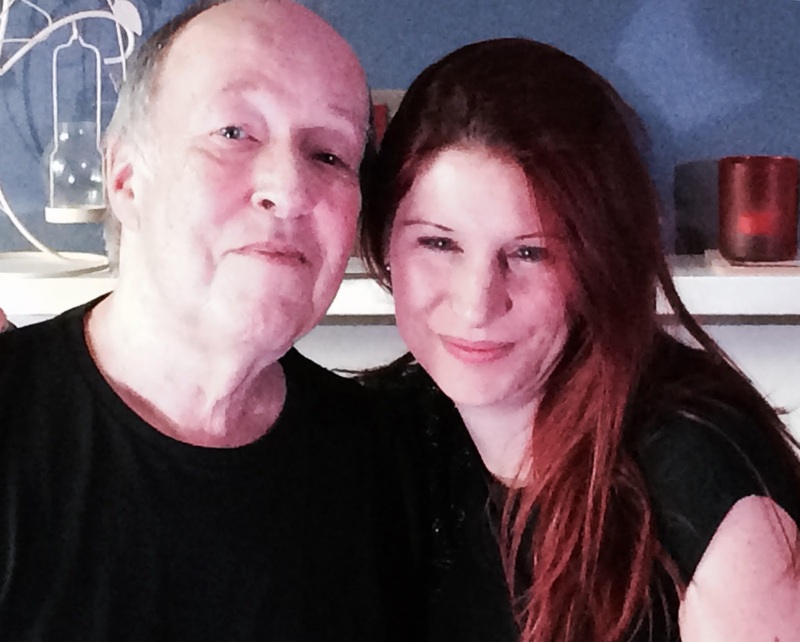 Thanks to the lovers, the dreamers and you.